I had setup a PC-based (Cubase SX2) home studio and was, in early 2004, considering acquiring a few classic outboard signal processors. Unfortunately, the street prices for vintage gear such as the Teletronix La2a, Pulse Technologies Pultec EQP and UREI or Universal Audio 1176 - as well as high-quality new reproductions and equivalents - were out of line with my budget, and more realistically, my application. After considerable research, I built the La2a, Pultec EQP, and other projects myself - all at a fraction of replacement cost. A very accurate reproduction of the 1968 Teletronix La-2a for one-third the street price - DIY for roughly $800.00 USD. 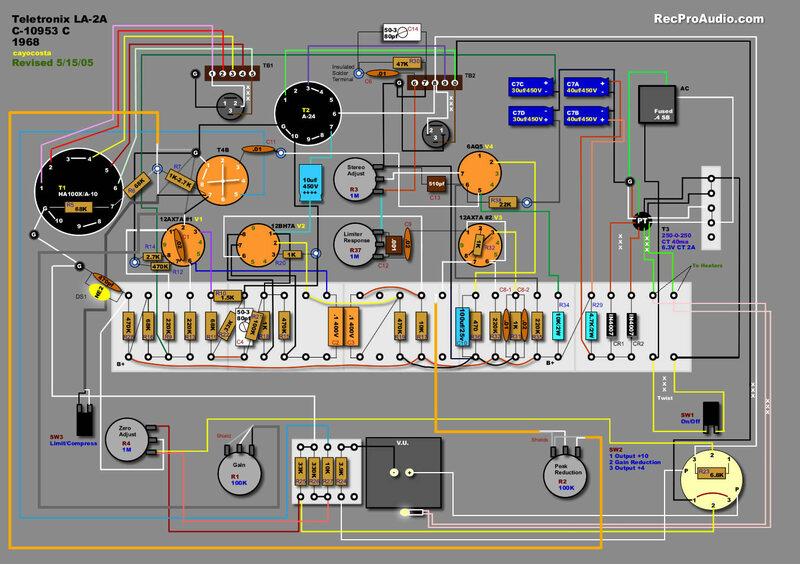 To begin, I wanted to build the La-2a optical compressor, and there had been a book available online, however it was based upon an older variant and it's wiring diagrams were true point to point, rather than turret-board based, like the late 60's variant. As I was interested more in the later model, I studied the 1968 schematic as well as many, many photographs of these units, and created the very popular 1968 La2a wiring layout. This single layout makes assembly simply a paint by numbers affair. So intuitive in fact, that build instructions would be redundant. About as close as you can get to a classic Pulse Technologies EQP-1a for a fraction of fair market value - DIY for roughly $800.00 USD. After completing the La2a, I concentrated on the Pultec EQP-1a program equalizer (circuit licensed to Pulse Technologies by Western Electric). However, for this particular project, there was nothing available online save the original Pultec manual, which fortunately did include the circuit schematic - but without the Pultec EQ filter section. 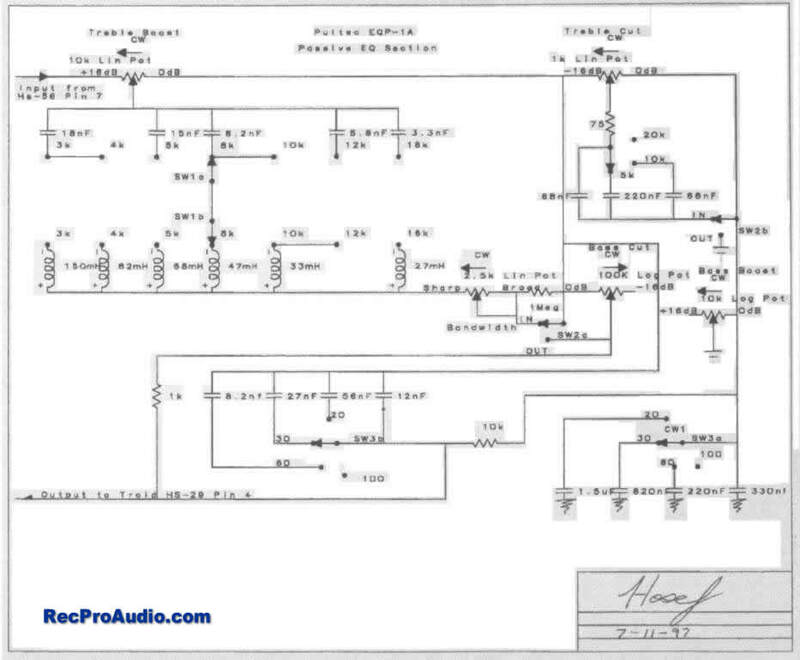 After quite a bit of investigation I was able to track down the passive filter schematic (thanks Brian! 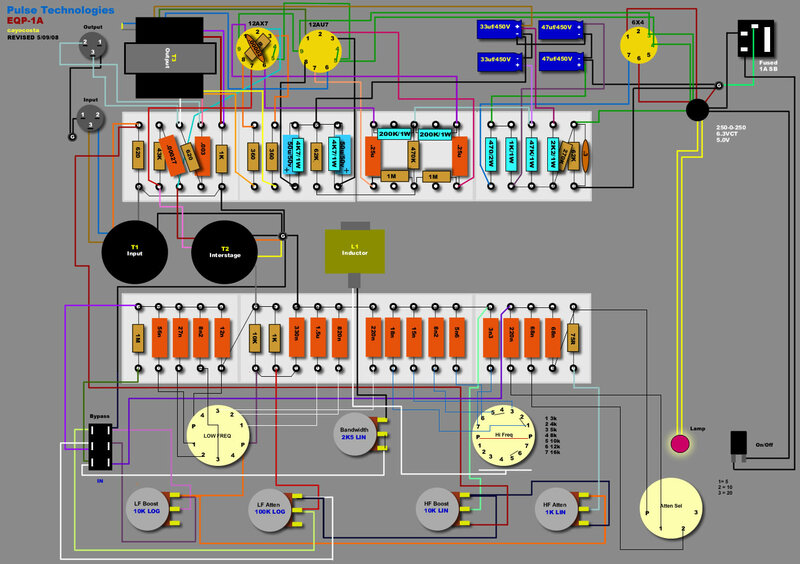 ), and from there created the Pultec layout. Again, working from countless photographs of vintage EQPs, I modified the layout to accommodate modern replacement transformers from Sowter, an inductor from Cinemag, as well as standard filter and signal capacitors. Due to the popularity of the layouts and supplementary information I've posted on the Internet over the last several years, I've launched RecProAudio, a new website featuring both of the above-mentioned classic projects as well as several other circuits - with additional contributions coming soon. Thanks for stopping by and please feel free to email with any questions, comments or suggestions.